For the complete version of the table, click here. 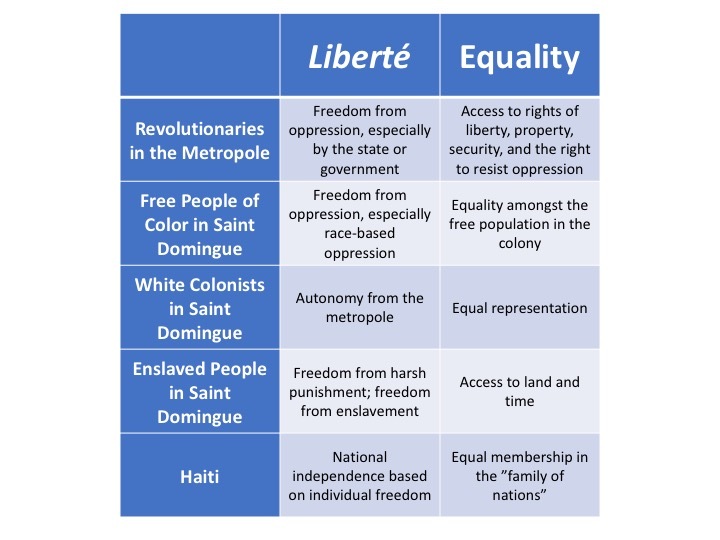 Julia Gaffield, Haitian Revolution, America in the World, 1776 to the Present: A Supplement to the Dictionary of American History. 2 vols. Blum, Edward J., ed. (Charles Scribner’s Sons, 2016). Julia Gaffield, “Reading Declarations: Universal Rights, the Local and the Global,” in Understanding and Teaching the Age of Revolutions, Ben Marsh and Mike Rapport, eds., (University of Wisconsin Press, 2017). Julia Gaffield, “Meet Haiti’s founding father, whose black revolution was too radical for Thomas Jefferson,” The Conversation, 30 August 2018. Jean-Jacques Dessalines to the President of the United States [Thomas Jefferson], 23 June 1803, Series 1: General Correspondence. 1651-1827, Microfilm Reel: 028, The Thomas Jefferson Papers at the Library of Congress, Manuscript Division.